I love opposite flavors in baking; if I have a chocolate cupcake, I want vanilla frosting, and if I have a vanilla, yellow, or almond cupcake, I want chocolate frosting. This cupcake has a very rich almond flavor, but if you prefer something milder, omit the bitter almond oil and just use ½ teaspoon of almond and vanilla extracts each. 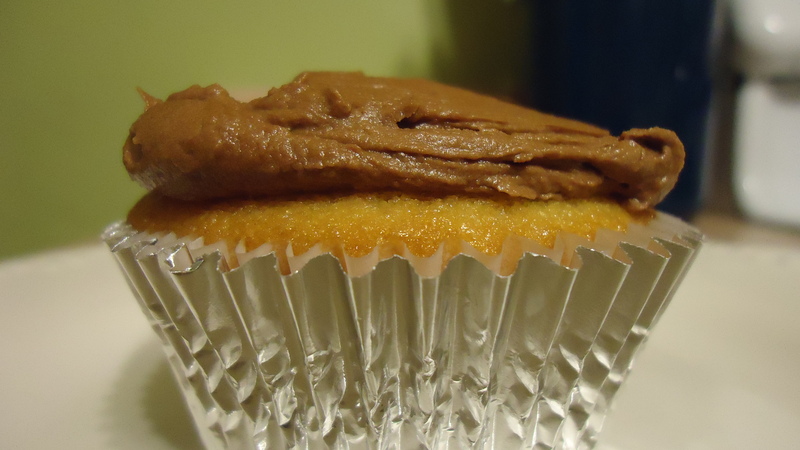 The fudge frosting has been adapted in measurement to frost 24 cupcakes; look for the full recipe in another post! Line two muffin tins with paper liners. Make sour milk; place1 ½ tablespoons lemon juice in a glass measuring cup and add enough milk to equal 1 1/3 cups of liquid total. Let stand for 5 minutes. Combine flour, baking powder, baking soda, and salt in a small bowl. Beat shortening in a mixing bowl for 30 seconds. Add sugar and flavorings, beating until combined. Add flour and sour milk, alternatively, until just combined. Fill liners halfway and bake for 21-23 minutes, until a toothpick comes out clean.